Simple, eye-catching summer shirts. The fresh, vibrant tones of spring and summer months are evoked in these classic short-sleeved gingham shirts. They are available in bright primary colours and made from lightweight, breathable materials for maximum comfort. 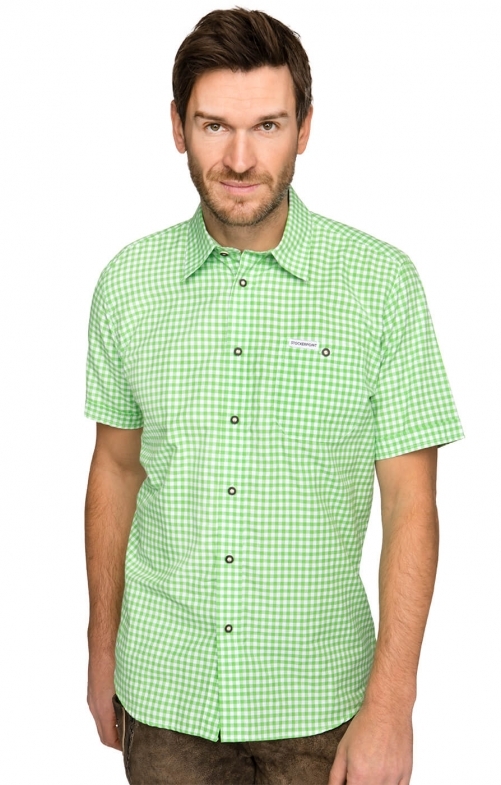 This shirt is a clean and cool green backed by pure white - a perfect match to neutral or earth shades. Team with corduroys or denim for a simple yet eye-catching charm. The high standards of design and craftsmanship make these pieces a valuable addition to the seasonal wardrobe. Tolles Hemd. Passt perfekt und sieht schön aus. Jederzeit wieder. Das Hemd ist leider so gar nicht etwas taliert geschnitten. Es wäre schön, wenn es verschiedene Formen gibt wie z. B. auch tailliert. Schönes Hemd, steht mir farblich leider nicht. Trachtenhose als auch zur Jeans getragen werden kann.